If you were to work with me or any one of my personal trainers one-on-one, you'd pay at least $550-$700/month. Even if you worked with a mediocre personal trainer you'd easily pay at least $400/month (for an inferior workout). And you'd be hard pressed to find a personal trainer out there who would put his money where his mouth is and guarantee your results like I do. Yes, Chelsea, even if it cost one million dollars for my health and happiness, it would be worth it. But the good news is that you won't pay anywhere near what the typical trainer charges for one-on-one training. Instead, your investment is as little as $6.40 a day... that's only $193 a month. And when you get started before Saturday February 4, 2012 , as a bonus, I'll throw in the first week of Boot Camp FREE! 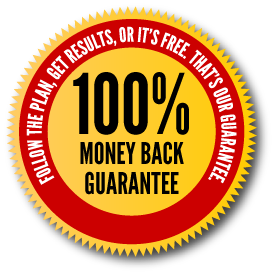 (A value of $149.75 in FREE bonuses) And to once-and-for-all remove all doubt about the effectiveness of my program, I'm backing this whole thing up with my HASSLE FREE MONEY BACK GUARANTEE! Yep...just fill the sheet out or call my office and we will get started no hassles, no gimmicks, just fun, challenging workouts in an environment that breeds success again and again!! Call now apply for a Trial workout and get started today I've even taken the risk factor out of it 562-570-5232. Fair Warning: Once you discover my Lean Body Fit Camp, you will never have an excuse to feel bad or complain about your body... So if you just like to complain then our Lean Body Fit Camp isn't for you. On the other hand, if you are seeking answers and truth to finally ending your fitness frustrations forever, then continue reading.